Educator and member of the Okanagan Nation, John Chenoweth has devoted himself to Aboriginal education at both the K-12 and the post-secondary levels for over 20 years. He teaches Aboriginal youth that everyone can be a leader, have a voice, and take ownership over his or her own life. 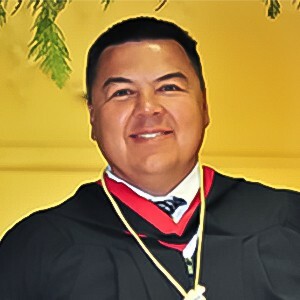 Chenoweth received his Bachelor of Education in 1994 from the Indigenous Teacher Education Program (NITEP) at the University of British Columbia. Later on he returned to UBC as a doctoral candidate in education. His doctoral research critically examines educational transition among Aboriginal adults. He considers specifically those adults who failed to complete high school, then go on to earn a secondary school diploma or equivalent, and later advance to post-secondary college education. Aligned with the broad themes of his research, Chenoweth co-established Steps Forward, a program dedicated to helping people with special needs make the transition out of high school to post-secondary institutions. In 2012, he was recognized with the National Inclusive Education Award by the British Columbia Association for Community Living (now Inclusion BC). Chenoweth held positions as an elementary school principal and as district principal for First Nations education. He is currently dean of community education and applied programs at the Nicola Valley Institute of Technology (NVIT), Canada’s only provincially-funded Aboriginal post-secondary institution. Over the course of his career, Chenoweth participated in three distinct strategies to improve Aboriginal success in the education system. He explored the need for more Aboriginal teachers within BC through First Nations steering committee projects. He advocated for promotion of Aboriginal educators into roles of leadership, such as school principals and district administrators. Additionally, he lobbied for and continues to expand programs at NVIT.